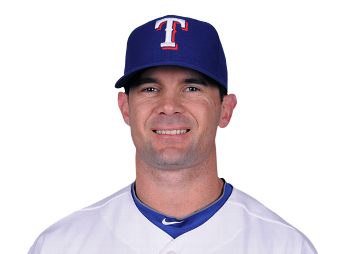 Today, Michael Young of the Texas Rangers reached 200 hits for the sixth time in his career. Arbitrary milestone numbers like 200 hits don’t matter as much to sabremetricians since the question often asked next is “What did he do with those 200 hits and what else did he do besides that?” In this case however, 200 hits does represent something of significance because, before the season, there was doubt about whether he would still be a starter for the Rangers. Back in March, the Rangers had signed Adrian Beltre to play third base instead of Michael Young. Michael Young, originally a shortstop, had moved to second base as a rookie in 2001 because the Rangers had acquired Alex Rodriguez. Once Alex Rodriguez was traded in 2003 to the Yankees for Alfonso Soriano, he was moved back to shortstop. Then, when Elvis Andrus was promoted to the big leagues in 2009, Young was moved to third base. He apparently was thrilled to make any of the position changes in the past. Yet in March, the Rangers were asking him to move for a fourth time to become the team’s primary designated hitter while also getting some time in at first base. Michael Young wasn’t happy. He was also signed to a large contract but was wielding little more than a contact bat with erratic power and a questionable glove. Now he was being asked to stay off the field and act as a “super-utility player” which suggested he would no longer be a full-time starter. So, he demanded a trade. Apparently, one of his young fans, Gavin Justice-Farmer, wasn’t happy either. It is unclear if, as wikipedia suggests that Michael Young saw Gavin’s video and after meeting the fan became convinced to stay with the Rangers. Nonetheless, he stayed. Even Gavin should be pleased with the results. Young has posted one of his best seasons while splitting time platooning at first base with Mitch Moreland, third base for an injured Adrian Beltre and designated hitter. Nor has his performance been the function of an empty batting average with slash stats of .332/.375/.473 and a .849 OPS. His .826 OPS over 297 at bats as a DH also would rank him as an above average AL DH behind leader David Ortiz at .973. His sOPS+ at the positions he saw significant time at, 1B, 3B and DH, indicate he outperformed the league average at those positions. Young also just tonight set a career high in RBI with 104, mostly a function of spending half the year batting cleanup. More importantly, his flexibility has helped buttress a Rangers lineup ransacked by injuries not only to the previously acquired and mentioned Adrian Beltre, but to Josh Hamilton and Nelson Cruz. While doing so, Michael Young’s flexibility enabled him to start 151 games and accumulate 200 hits. Whether Young gets that many opportunities to start (or hit) next year or remains as productive with the bat is anyone’s guess but at this point at least he will be another year as a Ranger. I think Michael Young and Gavin Justice-Farmer can both be happy with that.